Use the list below to determine which HubSpot tools or features you have access to based on your email provider, and which features require a connected inbox. Why must I connect my inbox to HubSpot to send email from the CRM? Automatically log email replies to contact timelines in HubSpot. Send email from contact, company, deal, and ticket records in HubSpot using your own email servers. Send email attachments as files (not links) from HubSpot. Take full advantage of HubSpot's sales tools (see above). When you send emails from your connected inbox, the replies to those emails will be automatically logged to the contact timeline, giving you better visibility into the communication with your leads and customers right in your HubSpot account without having to copy and paste or manually forward an email. In addition, any emails you send from the CRM will show up in your email client’s sent folder (this is not fully supported by all email clients yet). With a connected inbox, any emails you send from the CRM will be sent using your own email server IP address. This increases the likelihood that your emails will reach your lead’s inbox because those IPs belong to you or your company instead of shared among HubSpot users. Additionally, you may have noticed that emails you sent from the HubSpot CRM without a connected inbox had the line sent via hscrmemail.com at the top of them. This line is added by email clients when an email is sent from a server that doesn’t match the domain in the From field (for example, hubspot.com sending on behalf of email@yourdomain.com). When you connect your inbox, emails you send from HubSpot will be sent through your email server, so your leads won’t see that line anymore. 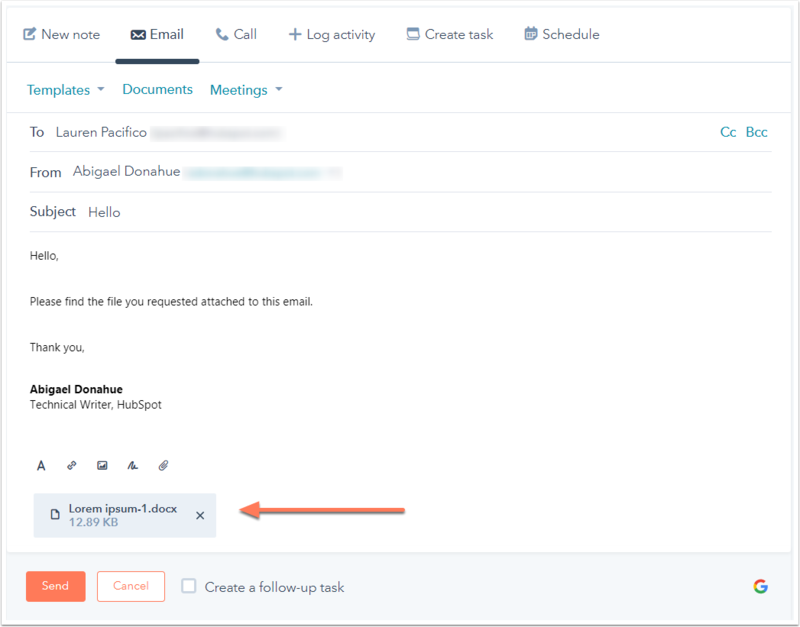 With a connected inbox, you can send an email attachment from a contact, company, deal, or ticket record in HubSpot, and your attachment will reach your contact's inbox as a file attachment, not as a link.